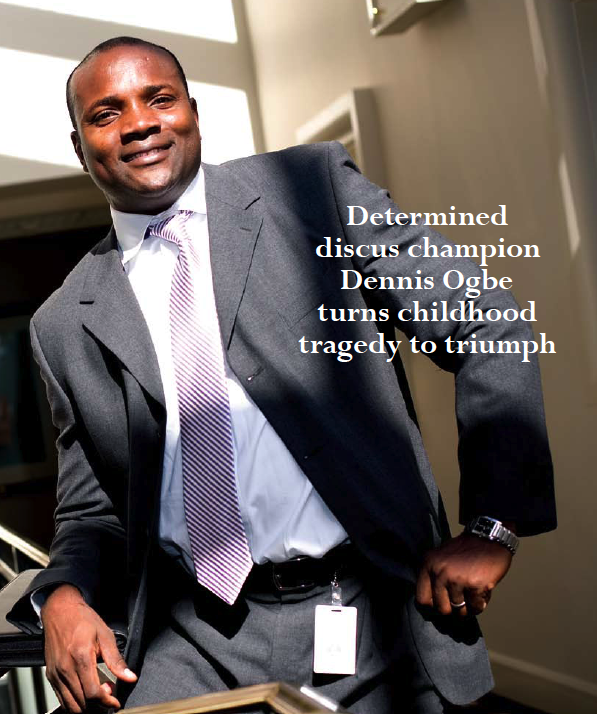 Dennis Ogbe grips the discus in his right hand. He swings his arm a few times, then twists at the waist as far to the left as he can. With one explosive move and a guttural cry he snaps back, letting the saucer fly. Upper-body strength is important for any discus thrower, but for Ogbe, it is everything. His left leg paralyzed and stunted by childhood polio, he lacks the balance that would allow him to spin 360 degrees before throwing. Instead, he leans against a special frame and propels the discus with 180 degrees of power. It’s tougher, yes. But Ogbe has never been one to shy away from a challenge, from willing himself to walk again, to making his way from Nigeria to the United States to get an education and to landing a job at a Fortune 500 company. He credits the discipline he learned from athletics. 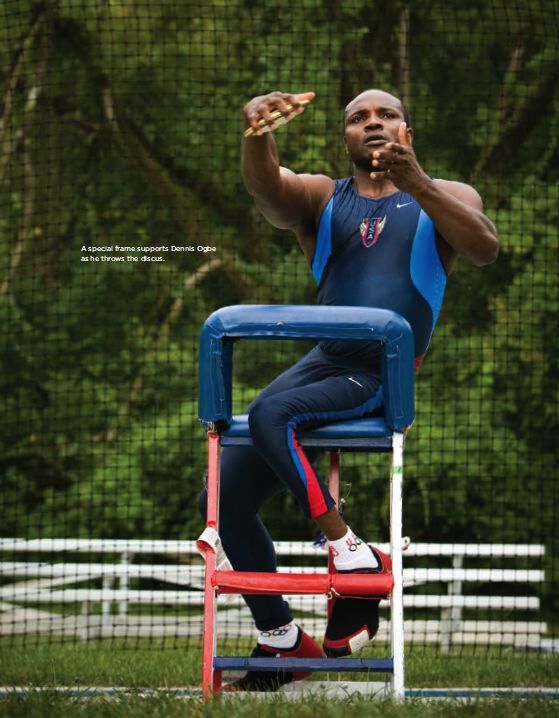 Where he is today is sitting at the very top of the world rankings in his discus event and, having become a U.S. citizen in February, preparing to represent the United States in the International Paralympic World Championships in New Zealand at the end of this month. “The category is very competitive. There are some very good international throwers – they are probably Dennis’ equal. But I’ll put my money on Dennis,” says Bellarmine track and field coach Jim Vargo, who helped bring Ogbe from Nigeria to Bellarmine, where he threw discus, shot put and javelin. Gratitude is the other thread that runs through Ogbe’s life. In conversation, he repeatedly turns attention away from himself to focus on those who have helped him in his journey – his parents, his friends, the Bellarmine community, his church, God. It has not been an easy path. When he was 3, Ogbe came down with malaria. A nurse at a Nigerian clinic broke a needle off in his back, and he fell into a coma that lasted for three days. Taken to a larger hospital, he regained consciousness but also contracted polio, which paralyzed both of his legs. Through the intervention of Masai Ujiri, a lifelong friend who is now the general manager of the Denver Nuggets, Ogbe was allowed to play. “On and off, my right leg got better and better and stronger. My left leg got weaker and weaker.” Eventually, he could walk without crutches or a cane, although he has a limp and balance remains an issue. But it was in track and field that he would make his mark. During tryouts for the Paralympic Games, he excelled in shot put, discus and javelin. He was throwing for Nigeria at the 2000 Games in Sydney, Australia, when he met Vargo, who was an assistant track and field coach for the USA. Ogbe and his teammate, Vitalis Lanshima, a sprinter who had lost both arms in a childhood accident, told Vargo that their dream was to come to the United States and get an American education. “At the Paralympics, you meet these unbelievably talented people with an incredible desire not to let what most of us would consider a significant disability to inhibit what they want in life,” said Vargo, who has been involved with Paralympics since 1990. “They are doing things that most of us wouldn’t even think are possible. They are very intelligent, very driven to be successful. They have the ‘it factor’ – the qualities that will make a very talented student-athlete. Even with his disability, Ogbe was very competitive in his track and field events, Vargo said. “He was competing at a very solid college level. He could throw with our best throwers.” And his work ethic galvanized the other team members. “When people see that – if he is out there every day and doesn’t miss a practice, and is able to do this despite a significant disability – it’s like, none of the rest of you have any excuse,” Vargo said. But Ogbe had struggles of his own. “I guess I’d never met anybody who was facing such big challenges – being so far from home, learning a new culture and trying to meet the demands of a different university system. And everything came together, all at one time,” said Cathy Sutton, dean of academic advising. When he wasn’t studying or training, Ogbe was working at one of five part-time jobs to meet his expenses. Vargo recalled hearing him singing and whistling as he cleaned the tennis courts at 6 a.m.
Dana Allen was driving to a Christmas party in 2006 when she saw a young man in a big gray wool coat carrying several Kroger bags in the snowy slush along Norris Place. “He had a big smile, but he was clearly struggling.” Something made her turn back and offer Dennis Ogbe a ride to his apartment just off campus. Learning he was an international student far from home, the Brown-Forman executive gave him her card and invited him to join her family for Christmas Eve Mass. “Then I went on to my party, and I said, ‘I just had this weird encounter.’ Everyone said, ‘You can’t go around giving people you don’t know rides!’ But I just felt like it was supposed to happen.” Ogbe did spend Christmas Eve with Allen’s family, and then became an unofficial part of it. “I call her my American mom,” he said. Allen connected him with Brown-Forman, where he held a series of part-time jobs before being hired full-time in 2009 as a human resources specialist for the North American region. And she stood with him when he married his wife, Dyan ’04, with whom he has a 2-year-old daughter, Mary Lou.